Fallen, but not forgotten: Baba Punjab Singh injured and still remains hospitalized from domestic terrorism shooting in Sikh Temple, Oak Creek, WI on August 5, 2012. I first heard of Oak Creek Sikh Gurdwara shooting, as many of you did, through the media, August 5th, 2012. The media mentioned the names of the victims, however, it didn't mention too much about the injured victims that survived, specifically Punjab Singh. It wasn't until I started working with the Oak Creek Community, providing support for the victims' families and the community that I learned of Baba Punjab Singh. Please note, I use "baba/babaji" throughout the article to show utmost respect for Punjab Singh, as an elder and wise person he is. Also I will refer to his son, Raghvinder Singh, as "veerji", as my brother. I met Babaji's sons and wife, who came from India weeks after the shooting. I soon grew close to them as they were simple GurSikhs filled with love and the essence of Chardi Kala. After learning that Babaji was in the hospital, I asked Raghvinder veerji if I can go visit his father in the Rehab center. To be honest, I was nervous to see him and was unsure how I would react looking at his face. Could I see the hole on his cheek where the bullet entered, damaged his spinal cord and came through on the back of his neck? Would I break down seeing a man of tall, beautiful , gentle being, now lying in semi-comatose, unable to move and unable to express himself? Baba Punjab Singh's family, a few families from the local sangat and I arranged to do Sukhmani Sahib paath and kirtan at the Rehab center. We gathered in the prayer room where I was anxious and nervous to meet Baba Punjab Singh for the first time. You see, I heard Baba ji was a katha vachik, one who enlightens about the teachings of Guru Granth Sahib's, so I googled him and found a recording on YouTube. He came to life as I heard his gentle voice on the video. I listened to his katha and felt how much he was in love with Sikhi, it was the fiber of his being. Would I be fortunate to know him and talk to him one day? Would he recover so I can discuss the discourses, ask about his life and probe the wisdom he gained in this game we call life? As we were in the middle of reciting Sukhmani Sahib paath, the nurse wheeled him. Listening to the paath, I saw him enter the room. Although I remained calm, I buried my head behind my chunni so no one could see my tears, as it was hard to see Babaji in this condition. I prayed Babaji would recover and no longer be trapped in an "unfunctional" body. The nurse took him away after only 5 to 10 minutes, as he couldn't handle being upright for too long. We finished the paath, kirtan and ardas. After the gathering, a few of us spent a long time in his room, as simran was playing constantly in his room, I listened to the life of Baba Punjab Singh through his wife, Kulwant Kaur and his sons, Raghvinder and Jaspreet Singh. This family has been through so many ups and downs, yet always kept their heads and spirits soaring, and smiles on their faces. After the shooting, Baba Punjab Singh was in a coma, then he suffered a pair of strokes leaving his left side paralyzed. He started to recover and respond with his eyes to affirm yes/no questions, however being in a bed 24/7 made him prone to bed sores, infections and other complications. It's been 3 years. Baba Punjab Singh remains in a semi-comatose state, his condition getting worse. However, when I ask his wife how she's doing and handling all this, her response is, "Beta, eh Guru dha bhana hai" (Dear child, this is all God's will), "Jo Guru Sahib dhi marjee hai, so sanu teek lagey gha" (Whatever Guru Ji does, is fine with us). Punjab Singh in his uniform in the Indian Army 1970. Not a day goes by I don't mention him in my ardas to my Guru, wishing him chardi kala no matter what state God wills him to be in. Internally I was wishing for a miracle that he would recover, meet his family, and could share his knowledge with us. He is an aged wise man, soon to be 68 years old, I know that chances are slim that he'll make a full recovery; therefore I wanted to share what I learned about Baba Punjab Singh and celebrate his inspiring life. I thank Raghvinder veerji for allowing me to share his story with all of you. Baba Punjab Singh was born on August 11, 1947 to parents, S. Pritam Singh Ji and Bibi Dalip Kaur Ji, in a village named Dhurkot, near Nankana Shaib District, Lahore, Pakistan. His family farmed for a living. He was the eldest and had 2 brothers and a sister. Baba ji was only a few days old when the family had to flee and migrate to India due to the partition in 1947. They ended up in Gurdaspur, Punjab in India. A majority of his relatives and friends migrated to Alwar, Rajasthan, therefore Baba ji's father moved the family there as well. 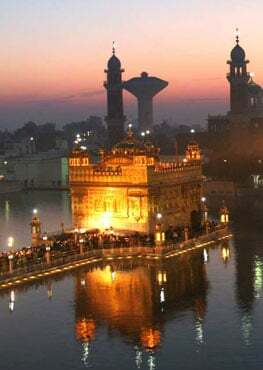 Baba Punjab Singh received his education in Punjab and Rajasthan, and then went to the Indian Army as a religious preacher, teaching about Sikhism, its philosophy and history. He served the Indian army for 19 years and fought in the Indo-Pakistani wars in 1965 and in 1971. Not only did he preach about Sikhi, but he led an exemplary life as a Sikh by becoming a saint-solider. He was one of the top field athletes for his unit. Babaji would sit and meditate for hours, sometimes skipping meals, to remember God. Every Vaisakhi and Guru Nanak Dev Ji's Gurpurab he would hold 2 huge Gurmat samagaams in the army. Baba ji also held amrit sanchars as many young men decided to take Amrit during their service in the army. After 19 years of service, he decided to take an early retirement from the army and focused on his family. Punjab Singh with his grandson. Bibi Kulwant Kaur, his wife, and Baba ji have 4 children, 2 daughters and 2 sons. They currently have 7 grandchildren. Baba Punjab Singh believed education to be a powerful weapon that can change lives. After retirement, he went village to village in various states doing parchar, teaching about Sikh way of life. In the villages he would visit, he would take notice of families who were poor and unable to pay for school fees. When he received his pension, he would instruct his son to go to the village to those families and pay the school fees, books, shoes and uniforms with his pension. Also if there were girls of marrying age, he would pay for their marriages. I was moved that Baba Punjab Singh never announced any of this when he held samagaams or hold discourses. Only God, his family and the families he helped knew of his compassion and generosity. He quietly did the work many of us think of doing but hardly act on. Even if we do a bit of seva, we boast about it. Punjab Singh helping victims of the flood in Punjab in 1989. Neighboring villages came to hear Babaji give discourses on Gurbani and inspire them with Sikh history. Babaji grew more popular, yet he would quietly just resume his meditation and keep focused on doing seva. A true GurSikh is an ambassador of Bhai Ghanaya, as was Baba Punjab Singh. Baba would kick into action when there was a disaster, such as a flood or an earthquake. He and his family would deliver food, blankets and other needs for the areas hit by the disaster. Raghvinder veerji recalls a few stories where his father stepped up to help save lives. Once a lady in the village jumped into the well to commit suicide, Babaji jumped in the well, saved her and supported and gave her hope in life. In another instant in a nearby village, there was a boat that top sided, he climbed on the bridge, which was merely a rope, and helped save the people on the boat. "Honesty, sincerity, simplicity, humility, pure generosity, absence of vanity, readiness to serve others - qualities which are within easy reach of every soul - are the foundation of one's spiritual life" wrote Nelson Mandela. While it's true these qualities are within all, the rare few realize and live it. I believe Baba ji lived up to these and other qualities. I asked veerji what memories he will hold dear of his father. He stated his father is his role model, his mentor, his counselor and friend. He guided the family to live a simple, compassionate GurSikh life. Baba Punjab Singh's humility and compassion are overwhelming. He dedicated himself to help orphans enrich their lives with education so they can stand on their own two feet. Sometimes, 100% of his pension went to help others, no matter if it meant that his family had to sacrifice something. Baba Punjab Singh went to areas where drug and alcohol use was prevalent, he would preach the Guru's teachings. The hopeless would be filled with hope, people changed, some started keeping their hair and even taking Amrit. I wondered, what is that lead him to change many lives, as we struggle to change even our own life? Raghvinder veerji told me Babaji believed in people, he didn't judge them. What made Babaji so admired by others was the fact that he, first and foremost, practiced the teachings of the Gurus, only then would he preach Gurbani. He would connect to the Guru and then he would connect others. "Aap japey, avere Naam japavey"
Baba Punjab Singh was dedicated to others. He once traveled to do katha in a village and got into an accident, leaving his collar bone fractured. He didn't go to the hospital and insisted he was fine. He knew there were 500 plus people waiting to listen to katha and didn't want to disappoint them. Babaji ignored the pain for hours and once the program was over, he discretely asked someone to take him to the hospital. For him, Gurmat vichar and sangat were two things he couldn't live without and a priority in his life. Perhaps I may not get my wish for Baba Punjab Singh to recover, however he has taught me so much about walking the talk of the Guru's teachings. Gently, quietly with every last breath, he continues to impact the lives of others. Silently, I speak to him with gratitude for being purely chardi kala, ever rising spirit. My humble request would be for us to pray for Baba Punjab Singh and give to a charity dedicated to educating children, empowering women or helping the impoverished. I know that is what Baba Punjab Singh would continue doing. "Thousands of candles can be lighted from a single candle, and the life of the candle will not be shortened. Happiness never decreases by being shared." - Buddha. Thank you Baba Punjab Singh for being the candle that lit many candles.